British Prime Minister Theresa May was consulting opposition parties and other lawmakers Thursday in a battle to put Brexit back on track after surviving a no-confidence vote, though there was little immediate sign of a breakthrough from talks branded a "stunt" by the main opposition leader. European Union countries were stepping up preparations for a disorderly British exit on March 29 after the UK Parliament rejected May&apos;s Brexit withdrawal deal with the bloc. Lawmakers threw out the deal Tuesday, in a crushing defeat for Ms May, who suffered the worst parliamentary defeat in modern British history. 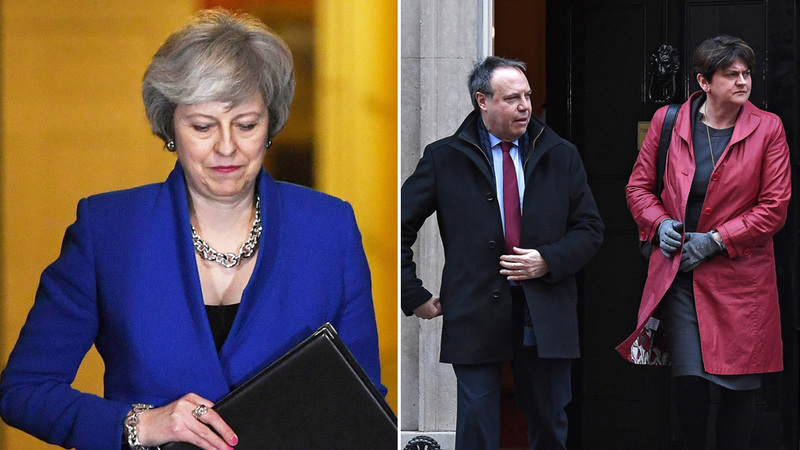 The drubbing was followed by a no-confidence vote in the government, but Ms May&apos;s minority Conservative government survived it on Wednesday night with backing from its Northern Irish ally, the Democratic Unionist Party. Ms May said she would hold talks "in a constructive spirit" with leaders of opposition parties and other lawmakers in a bid to find a way forward for Britain&apos;s EU exit. The government confirmed that Ms May will meet a Monday deadline to publish a Plan B, and that lawmakers will have a full day to debate it – and, crucially, amend it – on January 29. There was little sign of a breakthrough in uniting Parliament&apos;s feuding Brexit factions, whose conflicting demands range from a postponement of Britain&apos;s departure date to a new referendum on whether to leave the EU or remain. Jeremy Corbyn, leader of the main opposition Labour Party, said he wouldn&apos;t meet with Ms May until she took a no-deal Brexit "off the table". "To get a deal that can command a majority in Parliament, Theresa May has to ditch the red lines and get serious about proposals for the future," Mr Corbyn said during a speech to supporters in the English seaside town of Hastings. "Last night&apos;s offer of talks with party leaders turned out to be simply a stunt, not the serious attempt to engage with the new reality that&apos;s needed," he said. Green Party lawmaker Caroline Lucas, who met with Ms May on Thursday morning (local time), said the prime minister was "in a fantasy world" if she thought the deal could be transformed by Monday. May so far has showed little inclination to make major changes to her deal or lift her insistence that Brexit means leaving the EU&apos;s single market and customs union. Many lawmakers think a softer departure that retained single market or customs union membership is the only plan capable of winning a majority in Parliament. They fear the alternative is an abrupt "no-deal" withdrawal from the bloc, which businesses and economists fear would cause turmoil. Former Prime Minister Tony Blair, a longtime Labour Party leader, told the BBC on Thursday that it would be "sensible" for Mr Corbyn to meet with Ms May to better define the type of Brexit that Britain wants. He warned that a "no-deal" Brexit would do substantial harm to Britain&apos;s economy. As Britain flounders, the 27 other EU countries have stood firm, saying they won&apos;t renegotiate the withdrawal agreement and insisting the British government and its lawmakers to decide what they want to do. Some British lawmakers want Ms May to call for an extension of negotiations with the EU and postpone the March 29 deadline to leave the bloc, while others are lobbying for a second Brexit referendum. Throughout the Brexit negotiations, EU leaders accused Britain of trying to "cherry pick" benefits of membership in the bloc, seeking to retain access to the EU&apos;s single market while ending the free movement of European citizens into Britain and breaching other EU guiding principles. EU Brexit negotiator Michel Barnier, who said Wednesday that he was more concerned than ever that Britain could crash out of the EU without an agreement, said the red lines set out by Britain&apos;s negotiators had "shut doors". Barnier said Thursday that "getting an agreement is in everybody&apos;s interest" and that "something has to change" to secure a divorce deal. "If (the red lines) change, we&apos;ll change," Barnier said after meeting Portuguese officials in Lisbon.